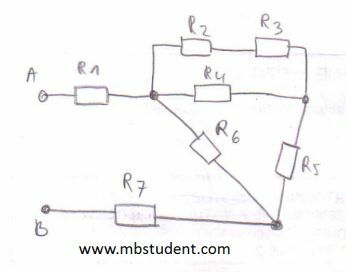 Exercises in which total resistance of electrical circuits is calculated. In some exercises relation between resistance R[&ohm;] and conductance G[S] is applied → G=1/R. In DC electrical circuits analysis, there is often a need to calculate they total resistance which is seen from power supply terminals. Knowledge about total resistance value is necessary to calculate value of current which flows through circuit. Value of main current which flows through circuit can be calculated with application of Ohm’s law → I=U/R. 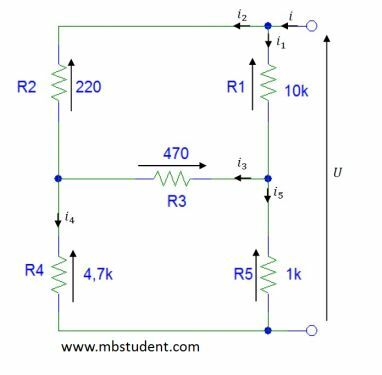 Calculation of total resistance for specific electrical circuit. Electric circuit in example has mixed connections between resistors. Total resistance is seen from power supply terminals, terminals are tagged with labels A and B. Electrical circuit contains three resistors in its topology. Some connections between resistors are specific. Nodes with the same electrical potential will be marked. As it is known between nodes with the same electrical potential, current doesn’t flow. 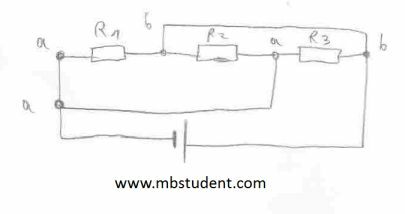 Calculation of total resistance for specific electrical circuit. Circuit is built with eight resistors. Electrical circuit in example has mixed connections between resistors. Total resistance is seen from power supply terminals. During total resistance calculation relation between resistance R[&ohm;] and conductance G[S] is applied → G=1/R. Some connections between resistors are specific. Nodes with the same electrical potential will be marked. As it is known between nodes with the same electrical potential, current doesn’t flow. Value of electrical potential in specific nodes is designated with formula for voltage divider. Electrical circuit is built in specific way because resistors create letter H. They look like H bridge. Designation of total resistance of this circuit is quite difficult. We can imagine that its side branches create voltage dividers. 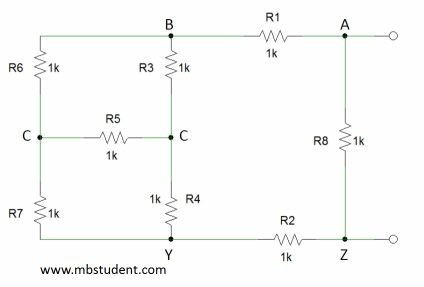 If that voltage dividers are equal no current will flow through resistor R3. 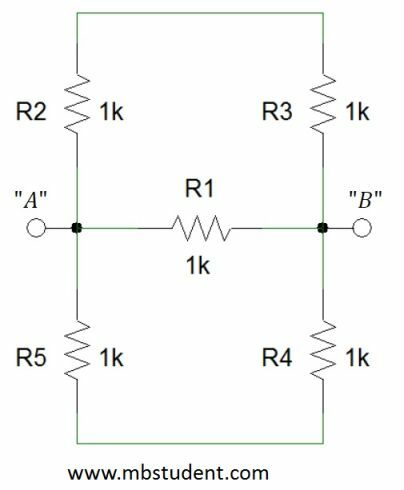 In that specific situation we can omit resistor R3 in total resistance calculation and treat circuit like there is a break instead resistor R3. You can download simulation in pspice and calculation in Excel to examine circuit behavior. Electrical circuit is built with five resistors. All resistor have the same value which is 1[k&ohm;]. Total resistance of this electrical circuit will be calculated. Total resistance is seen between specific terminals A and B. Resistors in circuit are connected in mixed ways, it means that they are connected in series and in parallel. Relation between resistance R and conductance G will be applied during calculations → G=1/R. Electrical circuit is built with seven resistors. All resistor have the same value which is 1[&ohm;]. Total resistance of this electrical circuit will be calculated. Total resistance is seen between specific terminals A and B. Resistors in circuit are connected in mixed ways, it means that they are connected in series and in parallel. Relation between resistance R and conductance G will be applied during calculations → G=1/R.